"Opens or closes without whip either on gravity or high or low pressure gasoline dispensers. Quick and positive in action. 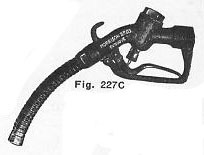 "A new hose nozzle that has "everything." It is tops in performance as well as eye appeal. New compound trigger action assuring smooth, controlled flow at all times, regardless of pressure. New trigger action prevents side thrust and undue wear on valve stem and packing. Oversize packing rings assure extra long long proof service. Trigger guard easily replaceable in case of damage. 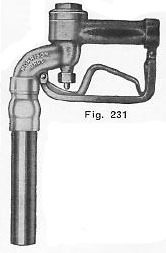 Curved tubing spout may be used easily and quickly locked in any desired position. Small diameter tubing designed for new style cars. 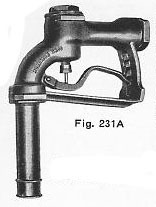 "Designed to meet the exacting requirements of Air Port service, these nozzles have many special features. The bodies are cast of special light weight aluminum alloy, with bronze trim where required for long service. The outlet may be fitted with check valve, or strainer or both. 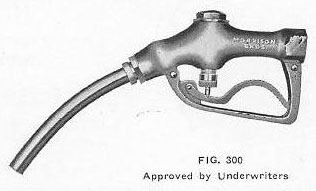 The spout may be flexible or rigid tubing, either of which may be had with protective dust cap. 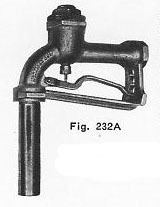 This dust cap is held in place with brass chain and special rust proof spring as illustrated. All information contained on this site is for personal use only. Any trademarks or trade names are the property of their respective owners, and are used on this site for collector identification.